The coming of war seemed an invitation to adventure, glory, honours. Or perhaps it was an escape from the slum, from the farm, from unemployment, or simply from boredom. By late 1915, however, war had become an all-devouring beast that made cripples of men and widows of women. Casualty lists spilled over the pages of the daily newspapers. Bombs tore up parks and tenements. Chlorine and phosgene clouds spread their greenish tentacles over the land. Trenches were dug deeper. And always there was the hammer of the guns. Still, there was another kind of war being fought high above the mud. It was a war where death seldom came from chance shell fired from miles away, where skill and courage made a difference. Up there, you could see your enemy. Better yet, at day's end there was a real bed and hot food. So for you, it is time to ignore the fellows who swear they’d never be caught in one of those damned flying machines. Forget your mates talking about falling in flames. Those things happen to others. The Deep Immersion Campaign is a chance to follow your pilot day by day through the war and share his story with the rest of the WOFF community. It is a DiD (dead is dead) campaign, meaning that if your man is killed you will have to start again with another pilot. If you’re using Robert Wiggins’s splendid “User Files Backup Program, you may revive your pilot only if you lose him to an accident not related to flying in the sim (e.g. a home emergency pulls you from the sim without properly pausing, a power failure occurs when you are over enemy lines, the cat eats your joystick cable while you are flying, etc.). •	initiate long leaves, such as home leave, transfer to training units, etc. The campaign moderator (CM) will do his best to be fair and balance any bad luck with good, so that you won’t always be flying an inferior aircraft. But, as would happen in real life, you might not always be flying your favourite machine and you're sure to have new experiences in WOFF. The Deep Immersion Campaign may see you fly in machines you’ve never spent much time in before, or in unfamiliar sectors of the front. You may fly training missions starting on 1 December 2018 (which in the campaign will be 1 December 1915). Your training missions will use the Quick Combat “free flight” feature and must be flown in accordance with the instructions below. Each pilot is to be given a first, middle, and last name. To avoid repeating the same old names as our previous campaigns, your first pilot’s MIDDLE name should begin with A, your second pilot’s MIDDLE name with B, and so forth. You may fly one pilot at a time, and when he’s dead he stays dead. You may begin a new career with a new pilot on the following day. As a option, you may wish your new pilot to be the same nationality as the pilot who shot you down. Use manual enlistment and choose your pilot’s name, nationality, birth date, place of birth, and the assigned squadron for operational deployment. German Luftstreitkraefte: In game, start as a Feldwebel, but in your written accounts you will remain an Offizierstellvertreter until promoted Leutnant. German Kaiserliche Marine: In game, start as a Flugmeister, but in your written accounts you will remain Oberflugmeister until promoted Leutnant zur See. France: In game, start as a Sergeant, but in your written accounts you will remain Sous Lieutenant until promoted Lieutenant. RFC: In game, start as a Sergeant, but in your written accounts you will remain a 2/Lieutenant until promoted Lieutenant. RNAS: In both game and accounts, start as a Flight Sub-Lieutenant. Americans may enrol into the French Aviation Militaire (fresh from the Foreign Legion) or into the RFC or RNAS (enrolment in Canada – at risk of loss of citizenship due to taking a loyal oath to the Crown). Transfer to the USAS will be an option in early 1918. To start the campaign, send a PM to Raine, preferably on or before 24 November 2018, with the name and nationality of your new pilot and a brief biographical sketch. State whether you would like to fly training missions in December or begin your campaign with a posting to the front in January. Also indicate whether you will begin your career as an NCO or junior officer. Your training missions in December will simulate the final stage of training, when you will begin to fly an operational type. The CM will send you by return PM details of you first posting, including the aerodrome and aircraft on which you will complete your training missions, your first operational (i.e. non-training) squadron, and your starting rank. The CM will assign your first pilot to fly two-seaters. Expect that your first assignment will last a while, as quick transfers to single-seat units are not historical. Later pilots may find that their first squadron is a single-seat unit, especially later in the war, but that’s up to fate (in this case, the CM). 1. Set your enlistment date for your operational squadron as 1 December 1915. 3. Let your campaign load and you will see your squadron details for 1 December 1915, or on the first day of flyable weather after it (December 1915 was a very wet month). Go to the Briefing Room to get a campaign mission, but DO NOT FLY THIS MISSION, as it will be an operational mission at the front and you still need to earn your wings. Instead, exit the Campaign screen and go to Quick Combat. 4. In Quick Combat, set the parameters to “Free Flight,” and set the region to your assigned training region (e.g. England, Germany), and set the field to your assigned training aerodrome (e.g. Netheravon, if that is where the CM told you to train). Ensure your initial altitude is set to “Field” so you take off from the ground rather than start in the air. Be sure you choose the assigned type of aircraft for your training flight. 5. In Quick Combat, fly one mission per day if you have overcast conditions, two per day in sunny weather. After the last flight of the day, exit Quick Combat and return to the Campaign screen. 6. In the Campaign screen, find the button reading “T+” and advance the time to the next day. The Campaign will then advance to the next day. Go to briefing room and generate the next campaign mission. Unless flights are cancelled due to weather, it will generate a mission on the next flyable day. DO NOT FLY THIS OPERATIONAL MISSION. Instead, return to Quick Combat and set up your next training mission from your training field. Continue until you have completed all your training missions and have a minimum of 15 hours of flight time. At that time you may deploy to the front, but may not fly from your new squadron until 1 January 1916. 1. TWO missions involving takeoff, climb to 1000 ft / 300 m, and land on your airfield five times. Ensure you leave your engine on when landing. If you damage your machine, you may not fly until the following day. 2. One mission involving a circuit below 3300 ft / 1000 m for 15 minutes within sight of the aerodrome. Do not turn off your engine. Then take off again and fly a circuit for at least 1 to 2 hours a bit farther away but still within sight of the aerodrome and below 6600 ft. / 2000 m.
3. One mission in which you climb to 10000 ft / 3000 m and remain there for at least an hour. Stay within sight of your aerodrome. 4. One mission in which you fly for an hour before landing somewhere other than an aerodrome. Do not turn off your engine and fly back to your aerodrome. Taxi back to your hangar. 5. TWO missions in which you take off and climb to 6600 ft / 2000 m. Cut your engine and glide down to you aerodrome, landing within 50 ft of a selected location. 6. TWO missions in which you practice aerobatics: slips, loops, and spins. 7. One cross-country flight to another airfield about an hour away. Land, keeping the engine on. Then take off and fly home. 8. Same as (7) above, but at night. 9. TWO flights practising strafing and / or bombing a ground target. RAF_Louvert has included ground targets for training at Catterick and Thetford for RFC pilots, so this will include a cross-country flight. 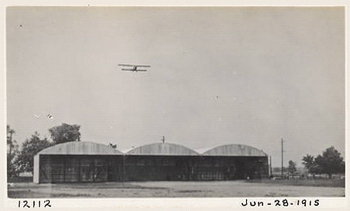 RNAS, German, and French pilots should practice on an isolated farm house near the home training airfield. 10. Deploy to the front after 25 December but not fly from your new squadron until 1 January 2019 / 1916. Alternatively, you may wish to create these missions using JJJ’s mission builder. Or Luddites like me can simply fly then in Quick Combat. RFC pilots will deploy from their assigned training airfield in England to St-Omer. RNAS pilots will deploy from their assigned training airfield in England to St-Pol-sur-Mer. They will be deemed to transfer from St-Omer / St-Pol to their squadron by tender before 1 January. French pilots will complete their training near Paris at La Réserve Générale de l’Aviation at Le Bourget and will deploy in their operational aircraft directly to their squadron on or after 1 January 1916. German pilots may ferry an operational type to their squadron, or may simply “take the train” there on or after 1 January 1916. While flying “full real” is preferred, you may use the following three aids if you must. Fly with labels set to “dots only.” You may briefly go to “Information” labels to check the name of a witness when you down an enemy machine, but must return to dots only afterwards. •	5000 m for 50+ hours flown in combat. Once at your squadron let the WOFF Campaign Manager schedule you a mission but ignore the directions. Instead, complete two circuits around your home airfield and land. Set all other aircraft in the flight to 5% fuel so you will fly alone. On your next mission less the WOFF Campaign Manager schedule you a mission, but ignore the directions. Fly to the front and back. Again, if hostile aircraft attempt to engage, disengage and RTB. On your third and following flights from your home field, follow mission instructions. After 35 hours (including transfer and familiarisation flights) you may, but are not required to, request a transfer to another squadron. Do this by sending a PM to the CM (Raine), detailing your total hours and specifying the desired squadron. The CM will either deny the request (in which case you must wait for 10 more hours of flight time), approve the request, or demand that you transfer to another squadron that you will be assigned. Once in a new squadron, you may ask for additional transfers, but the longer you wait, the more likely the CM will be to approve the request. 1. Emergency transfer: Your pilot sits for a week (7 days). After that, you may restart him in a new career with any squadron from his country. You'll need to manually track the pilot's combined record. 2. Wait: If this is a problem that will eventually correct itself (such as a squadron switching to a different plane), you can choose to wait it out. Your pilot will simply be inactive until he can play again. 3. Retire: You can retire the character and start a new one. The CM may assign a pilot to a period away from the front for a period of time. You can also request a break like this if you're going through a busy time in the real world. As CM, I'll simply assign an explanatory story, which you can work into your written accounts. RFC pilots should expect a required period on Home Defence or instructor's duties every few months. I'll PM any special instructions when this happens. If you hate this idea, PM me and we'll work something out. The essence of the Deep Immersion campaign will be the flight reports. Ideally, we’ll get to know your pilot and read the “ripping good yarns” you will write about him. Please try to breathe life into your character and give us an idea of who he really is. We’ll do our best to keep it historically accurate. From time to time, the CM may PM players with plot suggestions, interesting facts, or other ideas for your narratives. You are free to ignore these or use them as you choose. The intent is to add to the unpredictability of the campaign. Because the game award system is not tremendously historic, the CM will PM players with announcements of awards at appropriate moments. RAF_Louvert will play higher command. The CM will send him a message recommending a decoration, and he will have to approve before it’s final. At that point, RAF_Louvert will post his wonderful investiture photos and medal art and you may then mention the award in your written accounts. RAF_Louvert will periodically post a chart (such as the one shown on page 2 of this thread) showing the stats for our pilots. Gun sight view F6 is allowed. Let WOFF assign the number of missions per day. There is no campaign limit. There is no limit on the number of confirmed victories in a day. There were caps in the former campaigns, but recent versions of UE with historical claims settings are tough enough. External view not allowed if you have a head tracking system. The target balloon in a balloon busting mission is the only allowable balloon claim. 2Lt Cecil Anthony Melchett is very excited to have received his orders. Time to get out of the mud and into the skies! To be clear what about mods, which are allowed? I haven't made any rules about mods, but the idea of this campaign is to be as historically accurate as possible. So mods that focus on adding historic details or ground textures, like Lou and Robert Wiggins's airfields or Olham's rivers mod or Buckeye Bob's cloud mods would be fine. So would JJJ's realistic tracer effects mod be okay, as long as you don't introduce tracer too early (From late 1915 on RNAS Home Defence, April 1916 in general RFC use, and mid 1916 in French and German use, although I am open to correction on this). Mods that don't affect combat like the news mods or ArisFuser's historical aces mod are fine, too. I think the bombsight mods are okay, as would be Robert Wiggin's UI mod. If your eyesight is going, we'll look the other way if you increase dot size. I think we should avoid FM mods, though. I should have my computer working well by then so put me down For : Nigel Archibald Notting, Sgt , Rfc. A former shoe cobbler from Essex and Bicycle Tinker. Last edited by carrick58; 11/20/18 03:10 AM. Well the last DiD guy I did was German so sign me up for the RFC. I'll be 2Lt Percival "Drongo" Drummond. An Australian flying for the RFC who used to work in a bank. Let's say he loathed working in a bank so much that he took a revolver to work one day, shot the clock off the wall and announced to the stunned staff "Bugger this for a joke, I quit". He then spent his accumulated savings on passage to England and flying lessons. He's 23 years old, hot tempered and fond of a little tipple every now and then. Let's pretend I got the BWOC badge to embed here. Wenn ihr sieg im deine Kampf selbst gegen, wirst schwer wie stahl sein. Do you want this thread stickied Raine? That would be appreciated. Thanks! Nice one Raine! I've been away from WOFF for sometime and was just thinking about making a return... this will be perfect, thank you! PM to follow.. I'm in! Pilot profile PM'd. This will be a great way to spend hours on those cold winter days when I don't feel like venturing out of the house. Very complex for an old Geezers of 81. I will do my best! I would not miss this for anything! Really looking forward to it. Pilot has been sent up the channels to see where he will live his short life. Last edited by Wulfe; 11/23/18 11:48 PM. Don't worry, Wulfe! I may get only one day at my WOFF computer between now and 17 December! Thanks to all for stting this up. of course, I already missed on the directions, although minor: Raine, I forgot to note in the PM that Karl Arnt Loftus will definitely be doing training. He'll need it. Part One: In which I am born, do very little of note, and learn to fly. My parents were born in Stanmore, just outside London, where they were childhood sweethearts. Dad saw the army as the quickest way to earn enough to marry Mummy. He served with the 60th Rifles in Zululand and was promoted sergeant. He returned home in 1886, married my mother, left her with child, and headed for Canada to join the North-West Mounted Police. Soon he was writing home with thrilling stories of new communities springing up on the Canadian Prairies and occasional adventures controlling American whiskey traders. Mummy moved in with her parents in nearby Bushey and raised my sister Dorothy. Father sent for my mother in 1889 and they set up home on a farm outside of Regina, Saskatchewan. Regina was then, and still is, a little bit of bugger all surrounded by a whole lot of bugger all. I was born there in June 1896 but remember nothing of it. In early 1897, Dad quit the Mounted Police and left for the Yukon, where gold had been discovered. Mummy announced she was putting the farm up for sale and moving east to stay with a cousin in Ontario. If Dad wasn’t home by the end of 1898, she said, she would return to England and civilisation. Arriving in the Klondike, Dad quickly realized that prospecting for gold was one of the least likely ways to make a fortune in the north. Fortune intervened when he met a Dominion land surveyor named Bill Ogilvie, who was verifying the miners’ staked claims. Ogilvie mentioned that when the claims were corrected, many small fractions were orphaned. Dad began buying up the fractional claims. Then he began buying up bench claims – land up the slopes from the stream beds. As new prospectors arrived in the area to find all the good sites already claimed, Dad sold them shares. The miners did the real work and split the proceeds with Frank Collins. Enough of them found gold to make Dad very comfortable. Meanwhile, Dad befriended a Scot named Angus McCready who had set up a small distilling operation. Father bought him out, and within a year Collins Yukon Gold Whiskey was a well-known name. My father returned from the North just in time to prevent Mummy from leaving Canada. We settled back east in Kingston, Ontario, where we acquired a fine, stately home with a view of Lake Ontario, close by Queen’s College. Dad set up Collins distillery just outside town and hired Angus McCready to run it. My parents at last enjoyed a good life. Mother revelled in friendships with college professors and their wives while Father dabbled in Tory politics. I remember many elegant parties at the old house. As a boy I took a great interest in things mechanical, building iceboats to race on the frozen lake in winter and tinkering with motorcycles in the summer. School was quite another thing. I took little interest in studies, which caused Mummy to fret that I would be of little use to anyone other than the army. That suited me fine. We didn’t see many aircraft in Kingston, but after reading about McCurdy and Baldwin’s flights, I read anything I could get my hands on about aviation. 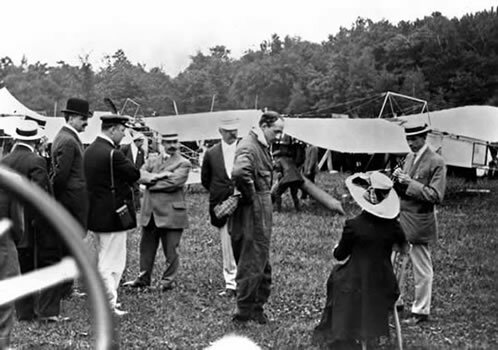 In June 1910, Dad let me accompany him on a business trip to Montreal and we got to attend the Montreal Aviation Meet, where I saw the Wrights and Compte de Lessep put their machines through their paces. From that point on, I knew what I wanted to do. In August of 1914 the world went mad. With Germany’s declaration of war, the entire Empire rushed to arms. As an eighteen-year-old, there was no question that I should go, too. I could see how it pained my mother, but my father’s only question was whether I should volunteer in Canada or head back to the “old country” to join the real army. The idea of joining the Flying Corps had been in my head for some time when I confided it to my father. His response was “Don’t tell your mother,” but he made inquiries and told me that it was possible to apply for the RFC without going to England, but it was first necessary to obtain one’s Aero Club of America licence. This could be through the Curtiss School in Hammondsport, New York. He gave me the four hundred American dollars I needed and promised to cover my room and board until I was taken on strength. And so the adventure began. Or so I thought. On 14 November 1914, my father suffered a heart attack and died. Dorothy and I thought we would lose Mummy too. It was as if the world had ended for her. Until then I had never understood that these two people, my parents, lived very separate lives but were bound so very tightly together. My mother announced at Christmas that she would sell the big house in Kingston and move back to England. Father had left her very well off. In his will he stipulated that I should inherit the distillery and pay dividends into trusts for my mother and sister. He also set me up with enough to be quite comfortable. So instead of heading to New York, I apprenticed at “my” distillery under Mr. McCready. It was a fascinating job, I discovered. Besides the craft of distilling, I engaged the comptroller, a Mr. Carson, to teach me the financial side of the business. I soon regretted my lack of interest in school work. The newspapers were full of talk of prohibition, and I worried that if I remained attached to the business I would lose my chance to fly for the Empire only to have the business shut down by the government. I directed Mr. McCready to work with Mr. Carson to prepare a plan to move the business to Quebec in the event of prohibition in Ontario. French Canada wisely looked down on temperance as a Calvinist (or worse, Methodist) plot. Last edited by Raine; 11/29/18 03:18 AM. You've set the bar pretty high Raine! And so it begins. A characteristically good start Raine. I'm still doing my homework as it were. But since it isn't December quite yet, I think I'm alright. Raine, great to see you start the ball rolling. James hasn’t done anything yet and it is already an exciting read. What is he distilling? Not gin, I hope? I’m waiting for Dec. 1 - the official first day of school. Great start Raine! James already seems quite 'real', thanks to your clever imagination and attention to detail.